Kitchen Window: Thinking Outside The Bento Box Originally just a convenient boxed lunch for Japanese field workers, bentos today can be high art, with flower-petal carrots, hard-boiled eggs shaped into bunnies, broccoli sculpted into trees. But you don't have to cook Japanese food — or make cute cutouts — to reap the benefits of the bento. 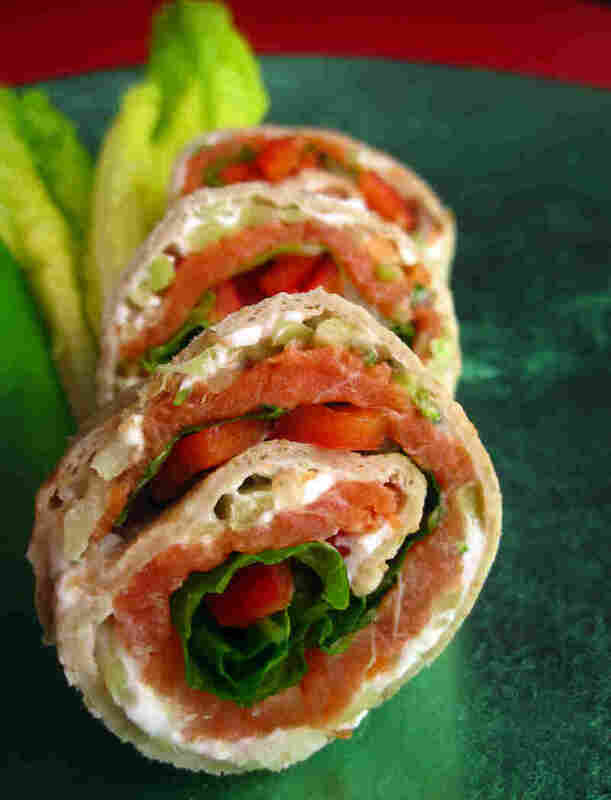 Get recipes for Spicy Tuna Stuffed Tomatoes, Salmon Musubi, Bright Pinwheels, Vegetables And Yogurt Dip and Syrian Egg Patties. I'm sure you're a very good cook. But if you want to feel bad about yourself, spend five minutes cruising the Internet for photos of bento boxes. They won't be hard to find. Originally just a convenient boxed lunch for Japanese field workers, bentos today can be high art, with flower-petal carrots, hard-boiled eggs shaped into bunnies, broccoli sculpted into trees. The moms who make them — because they're mostly moms, and not necessarily Japanese — are eager to share their edible masterpieces. The five main elements of a bento are color, texture, seasonality, presentation and nutrition (and let's not forget portion control — how much can you cram into those little compartments?). Confession: I have a problem with food that is cute. I even pick the buttons off gingerbread men. I'm also against expending that much effort just to coax my kid to eat. (Yes, my daughter thinks I'm "mean.") That said, I truly believe that we eat first with our eyes. And because of that, there is much to learn from the art of the bento. Bento boxes go back to at least the 5th century A.D., when Japanese field workers, hunters and fishermen would pack dried rice into boxes. Somewhere around the 19th century, makunouchi, or "intermission," bentos emerged, packed with side dishes and treats for theatergoers to munch between acts. When the railroads arrived, ekiben — station boxes — filled with local specialties became popular. 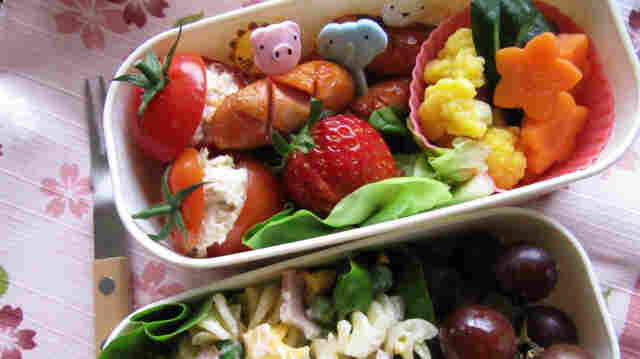 Today, many Japanese men and women carry bentos to work, and schoolchildren tote colorful arrangements of checkerboard-carved apples and rice balls shaped like Hello Kitty. Of course, these Japanese lunches will have Japanese food: rice balls (onigiri) stuffed with pickled apricot or baked cod roe, deep-fried pork cutlets, vegetables simmered in sweet soy sauce. But you don't have to cook Japanese food — or make cute cutouts — to reap the benefits of the bento. Cookbook author and Japan expert Debra Samuels says the five main elements of a bento are color, texture, seasonality, presentation and nutrition (and let's not forget portion control — how much can you cram into those little compartments?). She says many Japanese believe that including five colors on your plate — red, yellow, green, white and black — means you have a balanced meal. Michele Kayal is a food writer specializing in the intersection of food, culture and identity. Her work has appeared in The New York Times, the late great Gourmet, Bon Appetit, Conde Nast Traveler and many other national outlets. She writes regularly for The Associated Press and on her blog, The Hyphenated Chef. Many cultures — including our own — carry lunch in a box. In India, children and workers take tiffins — stacked stainless steel boxes filled with rice or bread, curry and vegetables. Korean dosirak offer jubilant heaps of bibimbap or perhaps sushi-like rolls called kimbap. Many American parents pack those Buzz Lightyear lunchboxes with organic, whole grain, gluten-, antibiotic- or trans fat-free foods. But all of these lack what are perhaps the most distinctive features of the bento: organization and an appetizing aesthetic. Face it, PB&J wrapped in plastic — whether it's organic or not — just isn't that appealing. Maybe that's why my kid-size containers — bought especially for school lunches — still come back half-full of the snap peas, blueberries or tabbouleh I put in them. What if you could make that food fun and appetizing, though? Even without the hearts and flowers? It doesn't have to be complicated. Just think of naturally hand-held foods. A wrap filled with meat and crunchy, colorful vegetables becomes a lunch cone. Slice it sideways, and it's pinwheels. Farmers markets, supermarkets and even some big-box stores are filled with gorgeous and delicious kid-size vegetables like mini zucchini and summer squash, fingerling potatoes, clementines, bell-shaped yellow and red cherry tomatoes, slender Persian cucumbers, tiny sweet peppers, and yellow, orange and purple baby carrots (real ones — not the ones lathed into bullets at the factory). Eggs provide easy, affordable, colorful protein — "cheap and cheerful," as a British friend says. You can boil them, turn them into an omelet or an herb-stuffed patty, all of which are delicious cold. Cheese comes in single-serving sticks and rounds, with varieties from mozzarella to cheddar and even chevre. And then there's the box itself. Like the food, the boxes in Japan can be works of art. Delicate cedar vessels and boxes of wicker and willow evolved from the simple wrapping of bamboo leaves and falconers' feed bags that are thought to be among the original bento boxes. The boxes can be slickly lacquered and painted with scenes. But today, a Japanese office worker is more likely to carry a sleek aluminum container with built-in gel packs or vacuum-insulated boxes. For children, there are boxes in the shape of frogs and pandas, boxes decorated with their favorite cartoon figures, even boxes that look like stacked Legos. Through the miracle of the Internet, many of these items are available online. One company even makes a bento — and that's what they call it — with colorful insert containers. Sleek, clean, the ultimate green lunch. A little color. Some crisp, beautiful vegetables. Just a few minutes of attention to feeding your eyes before your stomach, and lunch suddenly becomes a whole new experience. Just remember to say itadakimasu — "I humbly receive." Note: Recipes that accompany this story may not be visible on all mobile devices. You can find them at npr.org/recipes. The Asian flavors here put a nice twist on boring old tuna salad. 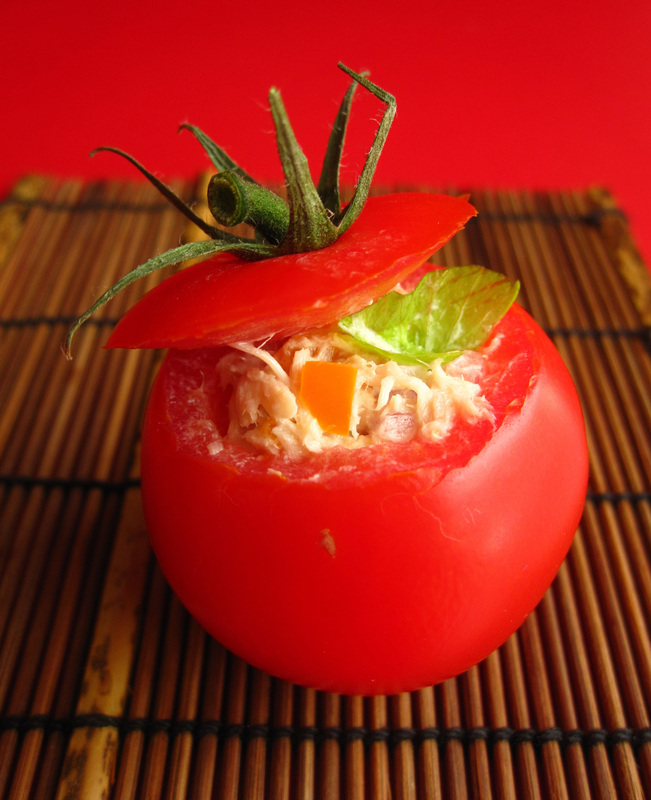 Using a tomato instead of bread is healthy, colorful and cuts down on carbs, too. Sriracha, a Vietnamese hot sauce, is available in most Asian groceries. The recipe is adapted from Debra Samuels' My Japanese Table (Tuttle 2011). Drain the tuna and place in a medium bowl. Add all of the ingredients except the tomatoes and stir gently to incorporate. Slice the top from a tomato and hollow out the center. Fill with the tuna salad. 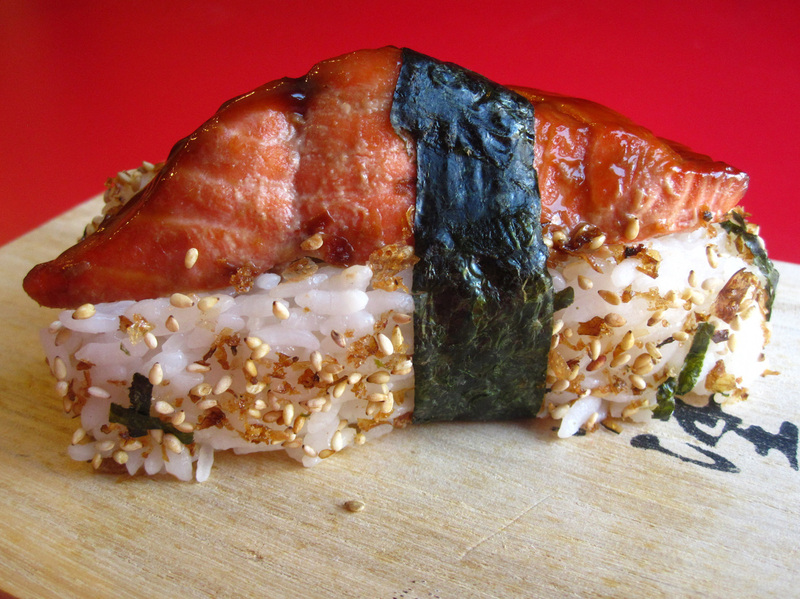 This is a riff on Spam musubi, a Hawaiian favorite that is far less healthful (and some would say less delicious). Here I've used hoisin on the fish, but try using miso in its place as well. The sushi rice is adapted from Debra Samuels' My Japanese Table (Tuttle 2011). Mirin, a sweet Japanese rice wine, is available in most Asian groceries, as are hoisin, miso and furikake, a Japanese seasoning mix. Pour the rice into a pot or rice cooker bowl and place under running water. Rinse until the water runs clear. If you are using a rice cooker: Drain the rice in a colander and let sit for 30 minutes. Then, place the rice into the rice cooker and add the water, sake and kelp, if using. Cook according to manufacturer instructions. 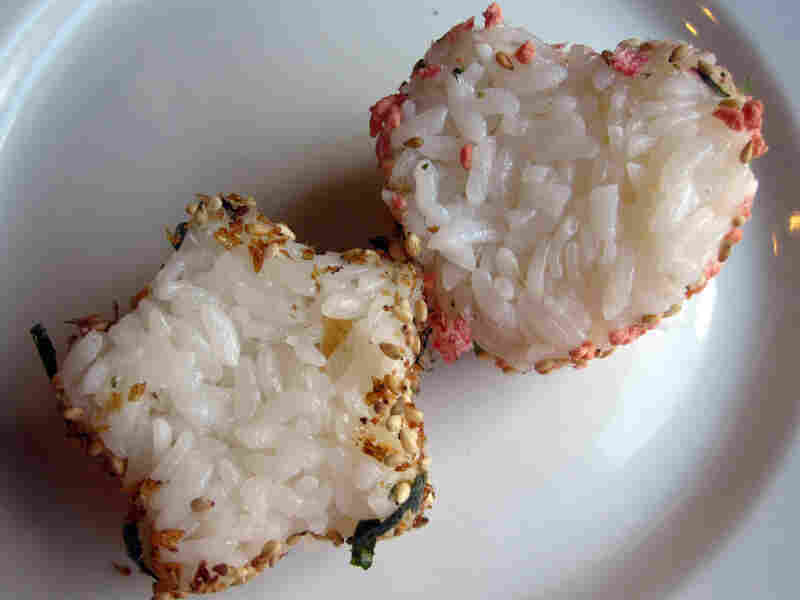 Leftover rice can be pressed into shapes; the sides are rolled in furikake seasoning. If you are using a pot: After rinsing, fill the pot with clean water so that it covers the rice by about 1 inch. Soak for 20 minutes. Then, drain the rice in a colander and let sit for 30 minutes. When it is drained, combine the rice, water, sake and kelp, if using, in a medium saucepan. Cover with a lid. Cook the rice over medium heat for 10 minutes. Turn the heat to low and simmer for 10 minutes more, or until the rice is tender. Turn off the heat and let the rice sit for 10 minutes. While the rice is cooking, combine the seasoning ingredients in a small saucepan. Heat until the sugar and salt dissolve. Set aside to cool. For the fish, combine the hoisin, soy sauce and mirin in a small bowl. Brush the sauce onto the top of the salmon. Place the salmon under a broiler for 6 to 8 minutes until the top is browned and the flesh is almost done. When the rice is done, transfer it to a bowl. Lift and fold the rice, preferably with two forks, to loosen it. Sprinkle the hot rice with the seasoning mixture a few tablespoons at a time, tossing as you go to coat all the grains. Taste as you go — you may not need all of it. Cover with a damp towel until you're ready to shape it. To shape the rice into a block, wet your hands and place 2 or 3 tablespoons of rice into your palm. Cup your hands together, shaping the rice gently into a block. When it is well formed, lay on a piece of wax paper. If using furikake or sesame seeds, sprinkle them onto the paper and roll the block in the mixture to coat the sides (not the top and bottom. Repeat to create a second block. Place a piece of salmon on each. Tie each bundle around the middle with a strip of seaweed. Seal the seaweed using a damp finger at the seams. Serve warm or cold. Shape leftover rice into balls using the same method. Roll in furikake for a tasty, quick snack or bento item for the following day. A wrap becomes colorful pinwheels when layered with bright ingredients and sliced sideways. I've used smoked salmon, but any sliced meat will do. Ditto for the vegetables: Use what you like. Carrot strips — made with a vegetable peeler — work very well. Spread the cream cheese over the tortilla. Sprinkle the broccoli slaw over the tortilla, creating an even layer. Lay the salmon over the slaw. Top with the pepper and then the lettuce. Roll the tortilla tightly, sealing with a smear of cream cheese at the seam if necessary. Using a serrated knife, slice gently into 1/2-inch pieces. What's more fun than food you dunk? 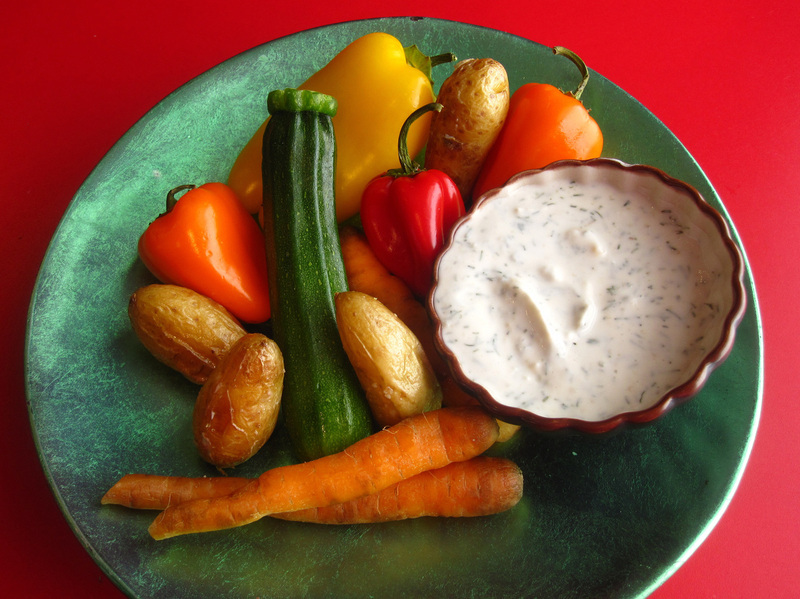 A colorful array of crisp, seasonal vegetables makes a great vehicle for yummy yogurt dip. Combine all of the ingredients except the vegetables and mix well to combine. Refrigerate overnight, if possible, to let the flavor develop. Serve with vegetables for dunking. These patties are perfect lunchbox fare: dainty finger food that tastes great tucked into a pita with lettuce and tomato. If you want to go all Middle Eastern, put hummus and vegetables in your bento, plus dates, olives and oranges. This recipe is adapted from A Taste of Syria (Hippocrene Press 2003), written by my cousin Virginia Gerbino and my uncle Philip Kayal. Turn the oven to 375 degrees. Spray 9 cups of a muffin tin with cooking spray, making sure to get the sides of the cups. Pour 1/2 teaspoon olive oil into the bottom of each of the nine cups. 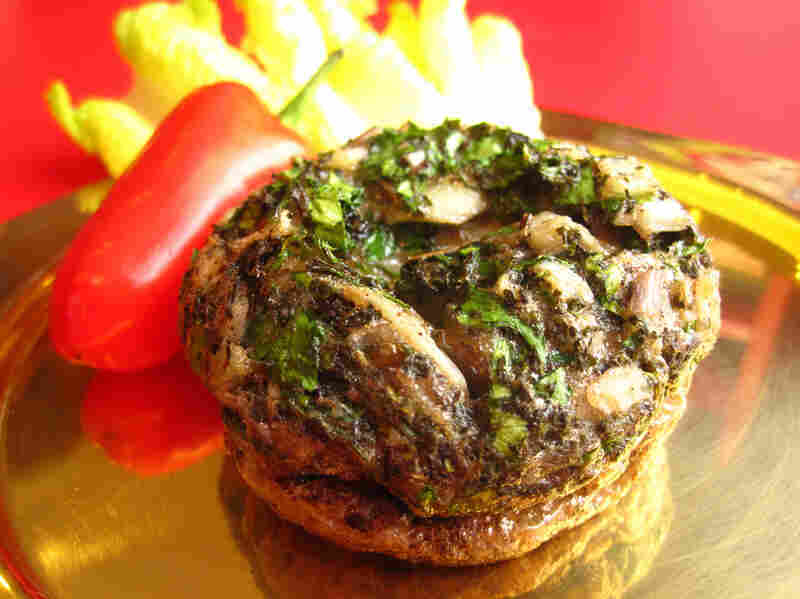 Place the muffin tin in the pre-heated oven and heat for 10 minutes. Crack the eggs into a bowl and beat gently just to break. Add all remaining ingredients and whisk until well combined. Carefully remove the hot pan from the oven. Pour the egg into each of the nine cups, making each about 2/3 full. Bake for 10 minutes. Remove from the oven and let rest for 10 minutes, until patties deflate. Remove from muffin tin, cool completely, then refrigerate.